For other uses, see Bos (disambiguation). 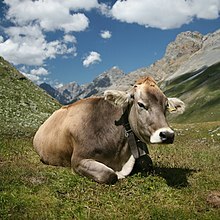 Bos (from Latin bōs: cow, ox, bull) is the genus of wild and domestic cattle. Bos can be divided into four subgenera: Bos, Bibos, Novibos, and Poephagus, but these divisions are controversial. The genus has five extant species. However, this may rise to seven if the domesticated varieties are counted as separate species, and nine if the closely related genus Bison is also included. Most modern breeds of domesticated cattle are believed to have originated from the extinct aurochs. Most species are grazers, with long tongues to twist the plant material they favor and large teeth to break up the plant material they ingest. They are ruminants, having a four-chambered stomach that allows them to break down plant material. There are about 1.3 billion domestic cattle alive today, making them one of the world's most numerous mammals. Members of this genus are currently found in Africa, Asia, eastern and western Europe, parts of North America, South America and also in Oceania. Their habitats vary greatly depending on the particular species; they can be found in prairies, rain forests, wetlands, savannas and temperate forests. Most Bos species have a lifespan of 18–25 years in the wild, with up to 36 being recorded in captivity. They have a 9–11 month gestation, depending on the species and birth one or, rarely, two young in the spring. Most species travel in herds ranging in size from 10 members into the hundreds. Within most herds, there is one bull (male) for all the cows (female). Dominance is important in the herds; calves will usually inherit their mother's position in the hierarchy. They are generally diurnal, resting in the hot part of the day and being active morning and afternoon. In areas where humans have encroached on the territory of a herd, they may turn nocturnal. Some species are also migratory, moving with food and water availability. Modern species of Bos are thought to have evolved from a single ancestor, the aurochs (B. primigenius). This particular species survived until the early 17th century when it was hunted to extinction as the last aurochs, a female, died in Poland. In 2003, the International Commission on Zoological Nomenclature resolved a long-standing dispute about the naming of those species (or pairs of species) of Bos that contain both wild and domesticated forms. The commission "conserved the usage of 17 specific names based on wild species, which are pre-dated by or contemporary with those based on domestic forms", confirming Bos primigenius for the aurochs and Bos gaurus for the gaur. If domesticated cattle and gayal are considered separate species, they are to be named Bos taurus and Bos frontalis; however, if they are considered part of the same species as their wild relatives, the common species are to be named Bos primigenius and Bos gaurus. Briggs, H.M. and Briggs, D.M. (1980). Modern Breeds of Livestock. Macmillan Publishing. Van Vuure, Cis. 2003. De Oeros – Het spoor terug, Cis van Vuure, Wageningen University and Research Centrum / Ministry of the Flemish Community, Brussels & Wageningen. Wikimedia Commons has media related to Bos.